Before I talk about beef and baseball I just wanted to send my thoughts and prayers to my friend, the Advanced Scout at Fire Brand of the American League, whose mother who is in the hospital. Like the Red Sox recent troubles against Texas this is just a temporary setback. Aside from being the president and an owner of the Texas Rangers Nolan Ryan also has his own brand of all-natural beef. 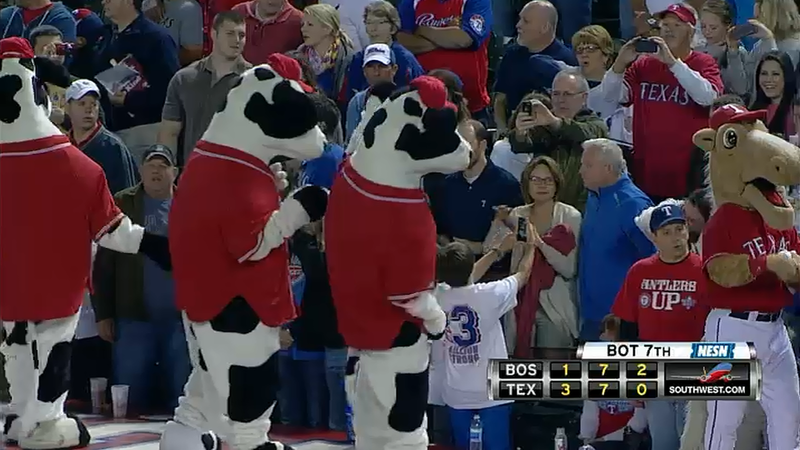 I suppose this herd of mascots is promoting what’s for dinner. Alexi Ogando wasn’t serving up meatballs. Boston hitters managed a meager six hits off of the fireballer. Only David Ortiz and Jarrod Saltalamacchia powered extra base hits. Ortiz’s second-inning double resulted in the his team’s sole run. Am I the only one who winces along with Ortiz whenever he runs the basepaths? Here is a rather large hot dog that in Texas terms is a kid’s meal. 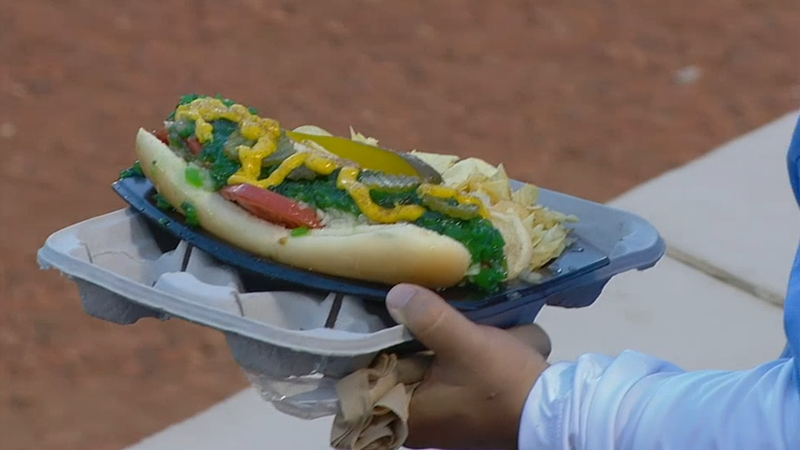 The radioactive green Chicago relish developed sentience and made its way to Arlington. 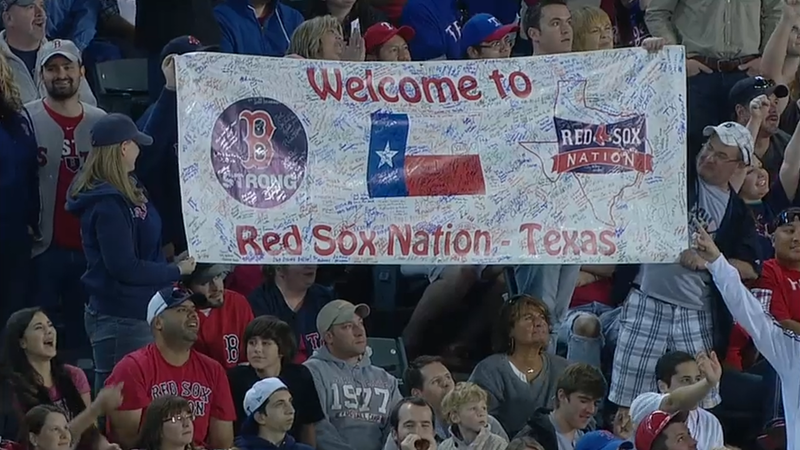 Boston fans were out in force but witnessed another loss against the Rangers. Stay strong! 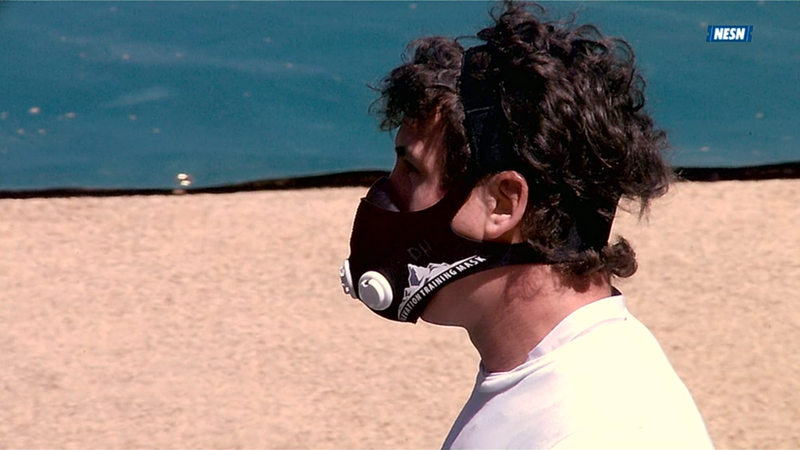 Derek Holland wears this mask for altitude training. I would check his phone records to see if he is calling physicists to weaponize nuclear power plants. His wispy moustache might be a disguise for comic book style villainy. Junichi Tazawa struck out three batters and allowed a hit in the seventh. If Koji Uerhara continues to give up longballs and runs I wonder if they might switch places? 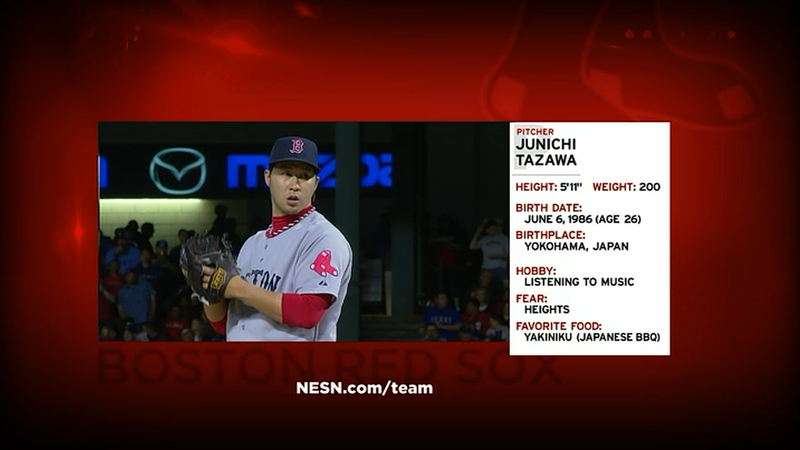 Tazawa’s favorite food is yakiniku, which are grilled meat dishes. The cooking style and restaurants were introduced to Japan from Korea. My favorite yakiniku place in Honolulu is a continent and an ocean away but I can at least visit the website to recall the delectable smells and flavors of grilling beef.